HorseBiz is an horse management software program that allows you to manage breeding activities, training costs, feed purchases, farrier visits, show records and awards, veterinarian visits, pedigree history for 5 generations, miscellaneous activities, inventory items and much more. All work is done from one main screen! No cumbersome screens to work through to input your data. Our product is flexible and will meet many different needs, from the person with one horse to a breeding farm with several stallions. The menu bar has icons for Reports, Help, Add Horse, Pedigree, Batch Records, Backup Data and Select Horse. The top half of the screen stays constant as you work in the folders inputting your information. Click on the word of the folder you want to work on and it comes to the front. It's fast and easy, you shouldn't have to move to different windows to work on your horse records. web browser, so you can go directly to our homepage if you have questions or need help. Horse owners can now use HorseBiz to build a custom database of pedigrees and create hypothetical matings with this powerful new addition to HorseBiz. Once the user has entered a horse’s pedigree, it is there to select "on the fly" in any horse’s pedigree – no retyping! Each horse is automatically linked to other horse’s in its pedigree, highlighting any horse that appears more than once in a pedigree. duplicate names in a pedigree. You can input unlimited generations. 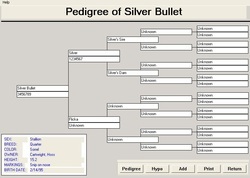 PedigreeBiz prints both pedigree and hypothetical matings.